Do you need French Translators / Translaters for the Translation from French to other languages? or from others to be translated to French? You have come to the right place. 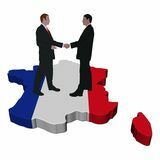 France has been identified as the third-largest Internet economy in Europe, with steady growth forecast for years to come. It has a maturing and advanced eCommerce market and close trade links with many territories across the globe. Canada has among the highest levels of Internet use in the world, in addition to high disposable income and, Belgium, which hosts the capital of Europe in Brussels, has an Internet penetration rate of 48%. All this points to French being a must-have European language. Daxell Translation know the French language inside out. We cover a range of industries from aerospace to education, we can provide fast, quality French translations at great prices. We can provide, among many others, legal, technical, marketing, website, medical, certified, financial and personal translation services, in addition to translations for the public sector. Our professional translation services stretch across a host of varied requirements, so we are exceptionally well-equipped to serve you. French translators provider for French translation service, French translating company bureau in singapore, French translating service bureau, We translate French to other languages, from other translated to French language service translation. Translating to French document text. French translators translate dutch documents, We are French translaters to english or other languages. We are proficient in localizing translations and translating into their mother tongue. We are therefore able to offer accurate and professional document translation services to our clients in Singapore & Malaysia. We always allocate a dedicated project manager to our clients, who will ensure you are kept up to date on your project, your deadlines are met and your document translation services are performed by a qualified and experienced translator.